You can verify your test scenario before running the test. This is useful to make sure that scenario does not contain errors, especially when you calculate parameters dynamically. Check/uncheck profiles in the list. The test will run with the selected profiles. Ignore think times between requests: If this option is checked, all pages will be executed without delays (specified in profile/request properties). However, the Delay operator is applied in any case. Click Verify to start the test. 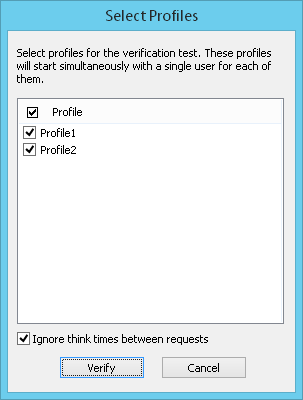 In the verification test all profiles start simultaneously. Each profile is executed one time by a single user. The first Load Agent checked in the list of Load Agents is used for the test. Note that you cannot define the number of virtual users and test duration for the verification tests. You cannot schedule such tests either. The test starts immediately after you click the Verify button in the dialog above. During the test, WAPT Pro collects the complete test data including server response codes for each request. On test completion, WAPT Pro generates the Summary Report and the full log of test run. Click on the Summary Report folder in the Navigation Pane to display the report. Expand the Logs folder in the Navigation Pane to see the log. WAPT Pro does not make graphs and HTML Report for the verification test. WAPT Pro performs optimization of variables. If some variable is not actually used for parameterization of requests, it is not created during the test. However, during verification tests optimization of variables is turned off to speed up these tests. At the end of verification test WAPT Pro displays a dialog suggesting you to set new values of baseline response times. Summary Report shows response codes for each request in the test sequence. Here you can read the detailed description of response codes. You can save the Summary Report as HTML file in required location. Right-click on the displayed report and select the Save Current Report to HTML... option on the context menu. You will be able to view this report later, at any time you wish just from a web browser. Full log will help you know what occurred during test run. It includes information on all requests, responses, redirects and returned HTML code. Log files are really important to verify that dynamic parameters are correctly found and calculated.